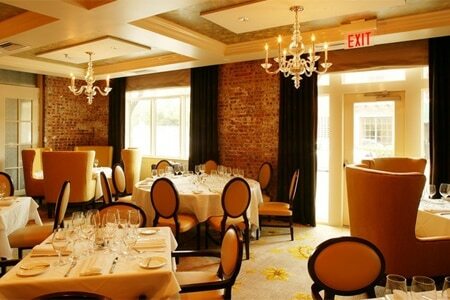 The Houston sibling of Commander's Palace in New Orleans turns out fine renditions of Creole classics. : You can't help but think that even an authentic New Orleans courtyard couldn't be this pretty, but the expansive stone-tiled patio dotted with wrought-iron furniture and anchored by an imposing fountain is truly striking. Indoor diners also can take advantage of its shaded beauty, without the ill effects of Houston's humidity, through floor-to-ceiling windows that wrap around the courtyard. The main dining room is not as eye-catching as the courtyard, but it is an elegant treat for lunches, dinner and, especially, the famous Brennan's brunch. That feast begins with appetizers like turtle soup or shrimp rémoulade. Entrées may include eggs "Brennan" and the Texas pecan crusted fish. And don't miss out on a worldwide tradition that started with this family --- bananas Foster, flambéed tableside. Although the restaurant boasts an extensive menu, lunch and dinner are best selected from its Creole classics. Try the veal chop Tchoupitoulas with herb-roasted sweet potatoes.